Every journey to Nottingham brings new thoughts. Every visit to your University is highly stimulating. And every trip is rewarding. 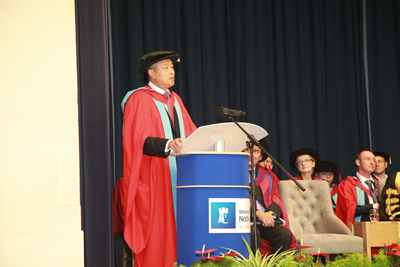 Undoubtedly the biggest reward of this visit is receiving the Nottingham's honorary doctorate of law. I am deeply moved by this degree being conferred on me. Therefore, I would like to first of all extend my heartfelt thanks to Nottingham University and to Professor Sir David. I take this degree as not only an honour for myself but also the recognition of the work of the Chinese Embassy in the UK. More significantly, it represents Nottingham's strong commitment and remarkable contribution to the educational cooperation between our two countries. Furthermore, it strengthens my personal ties with Nottingham University. I have been Chinese Ambassador to the UK for over seven years. Nottingham was among the very first universities that I visited. But, more than that, Nottingham is one of the British universities that I have paid the most visits to. However, my links with your university began much earlier. It reaches back over 16 years. In 2001, I was appointed Chinese Ambassador to Egypt. At the ceremony of presenting credentials to Egyptian President Mubarak, there were 15 ambassadors. These included three representing the US, the UK, and of course China, all permanent members of the UN Security Council. The US Ambassador David Welch is my fellow alumnus from the Fletcher School of Law and Diplomacy. The British Ambassador is an eminent Nottingham alumnus, Sir John Sawers. We were all in mid-forties and serve as Ambassador for the very first time. So, we were known as the "three rookies" in the diplomatic community in Cairo! Sir John later told me that he thought at that time he was "the youngest Ambassador in Egypt" and later found out that the Chinese Ambassador was one year younger than him. "A city is built on wisdom." I believe that: Wisdom comes with maturity and lays the groundwork for success. Wisdom is indispensable for building friendship between people. And wisdom is the path to deliver mutual respect and understanding between nations. Time flies and 16 years are like a 'split second'. The once youngest Ambassador in Egypt has now become the longest serving Chinese Ambassador to Britain! For seven years and more in Britain, I have had the honour to witness and personally contribute to a thriving China-UK relationship. This was most notable in 2015, when Chinese President Xi Jinping paid a successful State Visit to the UK. That State Visit ushered in the China-UK "Golden Era". China and the UK began a global comprehensive strategic partnership for the 21st century. Never before has China-UK relationship been so strong and so close as it is now. Bilateral trade grew from 50.8 billion US dollars to 74.4 billion. And investment from China to Britain expanded 13 times from 1.3 billion to 18 billion US dollars. This is much more than Chinese investment in any other European country. All major Chinese banks have come to London one after another, setting up branches or subsidiaries. The Chinese and British Governments respectively issued their first RMB sovereign bond in London. And London is now the largest RMB offshore market outside China. China-UK cooperation on the Belt and Road is also deepening. Britain was the first major western country to apply to join the Asian Infrastructure Investment Bank and the second only after China to contribute capital to the AIIB infrastructure project. Strengthening the UN and G20. Moving forward on antimicrobial resistance. And working together on protecting wild life. Our two countries successfully co-hosted the first Year of Cultural Exchange. Every year, more than 1.5 million mutual visits are made between China and Britain. Enthusiasm for Chinese culture and language learning has been growing across Britain. More and more British schools offer Chinese as the first foreign language in their curriculum. The Chinese New Year has become a popular annual festival in London and across the UK. The celebration at the Trafalgar Square, in particular, is now the biggest Chinese New Year event outside Asia. For the past seven years, I have never missed one. In China, the rising interest in Britain can also be strongly felt. Harry Porter, Downtown Abbey, Sherlock, and many other British films and TV dramas have a huge number of fans in China. The number of Chinese tourists visiting Britain keeps growing every year. Britain is the biggest European destination for Chinese students. This year, nearly 170,000 Chinese students came to the UK, compared to 120,000 seven years ago. Britain is home to the largest number of Confucius Institutes and Confucius Classrooms, increasing from 13 and 57 respectively seven years ago to 29 and 140 today. o Peking University set up separately with University of Cambridge and University of Edinburgh cultural and area studies centres in each other's campus. o Cambridge, Qinghua and others established joint low-carbon study centres. o There are also the Oxford-Suzhou Centre for Advanced Research and the centre for education on scientific innovation set up by Cambridge and Nanjing. 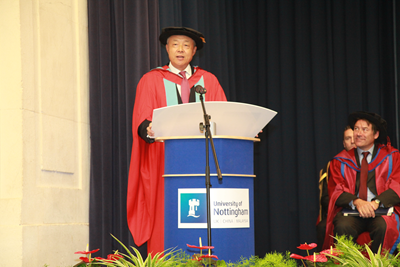 Nottingham University is the first British University to appoint a Chinese Chancellor and to set up a joint campus in China. 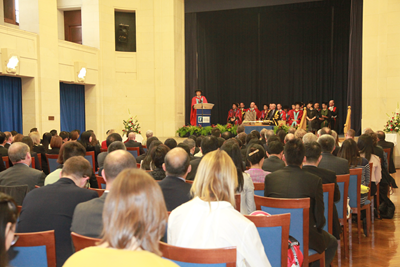 The Nottingham Confucius Institute is named a Model Confucius Institute. Nottingham University is home to more than 2,000 Chinese students. And Nottingham University is a leader in the study of contemporary China. In 2012, China and Britain co-established the High Level People-to-People Exchange Mechanism. At present, this mechanism has become one of the three major pillars underpinning the development of China-UK relations. It helps strengthen the top level design of our bilateral exchanges on cultural and people-to-people ties. It ensures stronger policy and institutional support. This year marks the fifth anniversary of the High Level People-to-People Exchange Mechanism. The new round of dialogue is going to take place in Britain in early December this year, which, I am sure, will produce more concrete outcomes. Looking ahead, the closer cultural and people-to-people exchanges between China and Britain will bring more benefit to the people of our two countries. In turn, this will further consolidate the public support for China-UK "Golden Era". Moreover, it will have a global significance and extensive influence. It will show that closer dialogue, deeper exchanges and stronger cooperation on the basis of equality and mutual respect delivers great benefits. It will smooth state-to-state ties and contribute to the harmonious co-existence between diverse civilizations. We should seek common ground while handling differences with wisdom. And we should always work to build China-UK relations on foundations of wisdom. On today's occasion, I cannot help thinking about my graduation from my alma mater, Dalian University of Foreign Languages, more than 40 years ago. Back then, I was like each and every one of you sitting in this hall, young and eager to explore. At that time, my dream was to do something for China's diplomacy and for world peace and development. Luckily, my dream came true. I became a Chinese diplomat. In my four-decade long diplomatic career, I have had six overseas postings in four continents: Africa, America, Asia and Europe. But wherever I go, my heart is always with my homeland, China. As I understand, without a strong and prosperous homeland, any individual success would be meaningless. For a diplomat, no individual behavior is really individual. Whatever you do, you represent your country. Indeed, my time here in Britain, over the past seven years, made me feel even more deeply about this. Recently, a documentary being shown in China has become a big popular hit. It is called "China's Diplomacy." This film series is an overview of China's diplomacy under the leadership of President Xi Jinping over the past five years. I highly recommend this documentary to Nottingham teachers and students. As China develops and as China's diplomatic endeavors unfold, I have every confidence that we will be able to contribute more of China's wisdom and China's solutions to the cause of world peace and development. 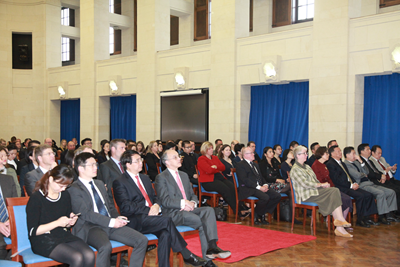 Young people like you will be the ones to shape the future of China-UK relations. And, you will be the ones to make sure the world continues to develop and make progress. It is my sincere hope that you will keep these words in mind, take a global vision and live up to the spirit of Nottingham University. In consolidating the China-UK "Golden Era". And in building world peace and prosperity.